Manny Pacquiao has held on to this WBA World welterweight title after a unanimous win against Adrian Broner in Last Vegas. The Filipino boxer, who recently participated in the 70th fight of his career, as well as his first ever since turning 40, retained his title against the former four-eight world champion with a powerful left during the ninth round. Pacquiao dominated most of the match, outclassing his American opponent, his junior by 11 years, and landed more than double the punches throughout the rounds. By the end, judges had scored the fight 117-11, 116-112, 116-112 in favour of Pacquiao. 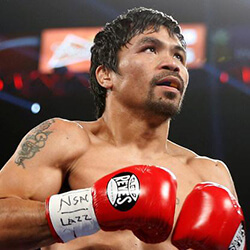 After the match, Pacquiao told reporters that he would be interesting in taking on American Floyd Mayweather, who he faced and lost to in 2015; leaving Mayweather currently undefeated since the bout. Talking about a potential fight, Pacquiao said that Mayweather must come back to the ring so that they could fight. Pacquiao, who works as a senator in his home country, fought for the first time in the United States in two years. Mayweather, how is a former five-weight world champion was in the crowd for the fight, and gave no reaction when inquired as to whether he’d be interested in a rematch. The boxer, 41, beat Japanese kick-boxer Tenshin Nasukawa during an exhibition match in December last year, but has still maintained that he has no interest in ending his retirement and getting back into the ring. 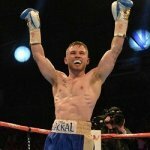 Carl Frampton won the vacant WBO interim featherweight title after winnings against Nonito Donaire in April this year. 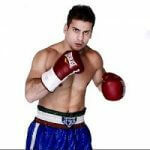 He is now set to defend his title against Luke Jackson in …. Set for early May, WBO reining junior lightweight champion Vasyl Lomachenko is pitted against for a showdown against WBA lightweight champion Jorge Linares. Many believe that this will be one …. 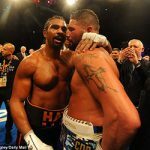 Tony Bellew made news when he sank his teeth into his current opponent, David Haye, telling reporters that he believes Haye is a, “wounded and desperate animal” at a recent …. Phil Lo Greco has sent an ominous waning to World Champion Amir Khan, stating that Khan needs to start looking at his options outside the ring in a bid to …. 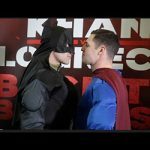 In an amusing publicity stunt, Sean Dodd and Tommy Coyle arrived at a press conference dressed as Batman and Superman. 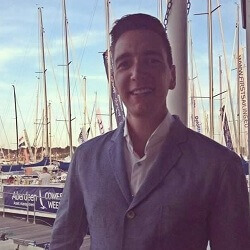 The dress up was clearly referencing the popular showdowns between ….